Back in my younger days (read: college), I was busy all the time and I was enthusiastic, energetic and diligent about the responsibilities on my plate and the tasks on my to-do list. I drank a cup of coffee for breakfast, usually while in class or while working, definitely while doing something else rather than just sitting and sipping. I ate lunch when I thought about it. If I missed it, no big deal. I was busy, I had stuff to do and places to go, there was just no time to break for lunch some days. If my tummy was in danger of growling during class, I’d get a Diet Coke and a bag of chips and be fine until dinner. Sometimes we’d set a time and place to eat lunch so that I had a really good reason not to skip it. But mostly, lunch was just an afterthought in an already overbooked, attention-stretched day. But now lunch is a whole different story. Now that I spend my Mondays through Fridays sitting at a desk beneath fluorescent lights in an excessively air-conditioned building, lunch is an absolute. It’s the time every day that I can go for a walk, breathe fresh oxygen, eat something delicious often with bread and melted cheese, and feel more human than robotic for a little while. Since its importance is well-understood in this office, my co-workers and I discuss lunch options for at least an hour (cumulatively, while working of course) every morning. Sometimes we plan Friday’s lunch during Thursday’s lunch. And on occasion, like when the Red Hook Lobster truck was scheduled to visit Dupont, we plan days in advance. 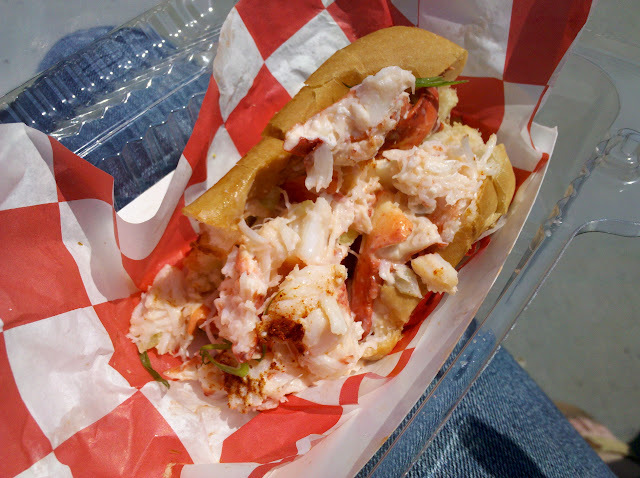 This lobster roll was completely worth the days of anticipation and $15. Elizabeth, the lunch champion, also enjoyed it. Thank goodness for the food truck craze in DC — it’s keeping our lunch options in the neighborhood remotely entertaining. Last month we planned a visit to the grilled cheese truck — which made me anxious since it’s a lifelong dream of mine to own a grilled cheese shop. Thankfully the one I got ended up being just okay, so my dream isn’t totally shattered. There’s room for me in this market still. And yet we spent an hour or more periodically discussing lunch options today because we’re bored of the usuals — sushi, Cosi, Five Guys, Sweetgreen — and the food trucks are apparently against Dupont today. 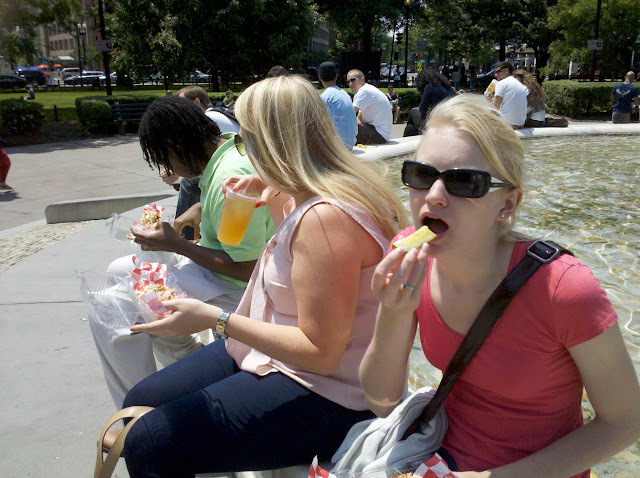 Posted on May 19, 2011, in 25, Food, Friends and tagged 25, food, food trucks, growing up, lunch, post-college, work. Bookmark the permalink. 7 Comments. And I read this while I ate Chipotle that I just went to get with you. yum. Don’t forget that we often plan lunch while eating breakfast. It’s just that important! Perfect blog post to read while I ate cole slaw from a deli container!